This week we kick off the first day of summer with a rundown of awesome food things to do starting today and continuing through the weekend. Tops on list: The Arroyo Seco festival comes to the Rose Bowl for two days of bands and chef-driven eats. 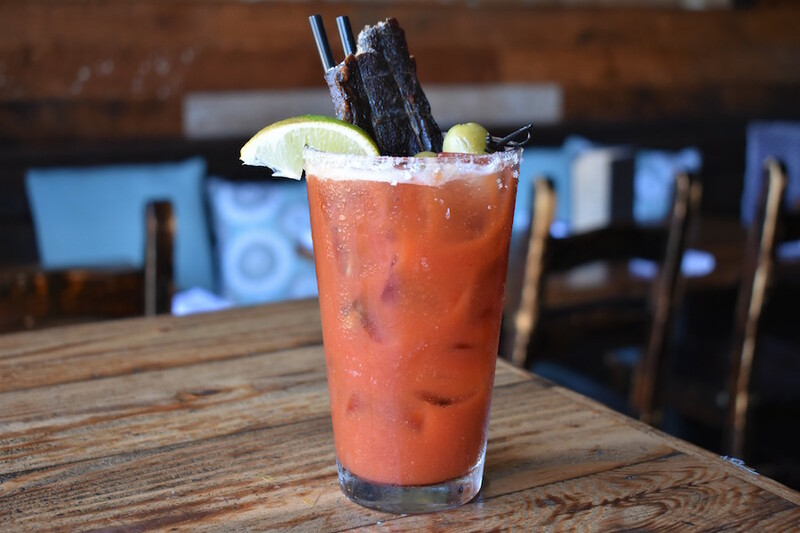 Also of note this week is a ‘Bloody Bull’ made with beef broth and garnished with beef jerky, a special Baja Night Market pop-up, a brand new edition of 40z & Waffles, and much more. There’s a new hangover drink in town and it’s called the Bloody Bull. Made with beef broth, A1 steak sauce and garnished with homemade beef jerky and green olives stuffed with smoked bleu cheese. The drink cost $7 and can be found at The Standing Room. 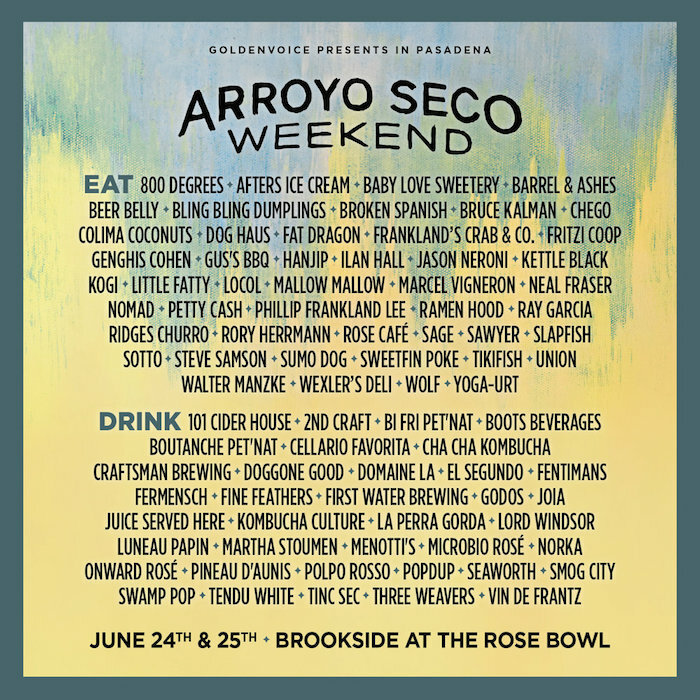 Arroyo Seco is this weekend and some of the coolest chefs and local food purveyors will be on hand to feed you. Take a look at the poster below and start planning your meal breaks NOW. Boiling Crab in Burbank will open it’s doors Monday, June 26 at 140 E. Palm Avenue. The grand opening is guaranteed to draw lines and will include free swag. Food Events for this Week in L.A.
1. Spend an evening poolside under the stars enjoying dinner, cocktails and a film as Mr. C’s Poolside Cinema returns with a screening of Chocolat. Food offerings include a Mr. C Club Sandwich with fried egg, Pizza Mr. C with burrata and Prosciutto crudo di Parma, and Mr. C Avocado Salsa with toasted pizza crisps. You can also enjoy some caprese-style popcorn, candy, mini bottles of Moët & Chandon Champagne, or, if you prefer beer, Peroni Nastro Azzurro on tap. 2. The Santa Monica Food Truck Lot hosts gourmet food trucks every Tuesday night from 5 to 9:30 p.m. at the California Heritage Museum on Main Street. This week food trucks include Cousins Maine Lobster, MiddleFeast, okamoto kitchen, hungry belly, The Original Grilled Cheese Truck and Street Kitchen LA. 3. Taste of Grand Central Market is a 1.5 hour guided food tour of the historic open air food hall. Your guide will help you navigate the dozens of stalls while sampling from vendors both old and new. 4. The 6th Annual Spiked Lemonade Tasting event provides folks with ‘passports’ to be used for redeeming lemonades all over Culver City. Take a stroll through the historic buildings, boutiques, theaters, galleries and unique restaurants of this up and coming city while sipping on lots of free lemonade. 5. Chicas Tacos in DTLA is celebrating their one year anniversary with Baja Market L.A. featuring vendors from Baja Mexico’s Valle De Guadalupe. For one night Chef Eduardo Ruiz will partner with Chef Omar Valenzuela of Baja’s Encuentro Guadalupe. Guests will enjoy special tacos, pours from wineries and breweries, a book signing from Bill Esparza, a custom Tacocidal Tendencies shirt and live music. The event will benefit COTAS – Valle De Guadalupe Water Conservancy. Tickets are available for $15 online or at the door for $20. 6. Feastly celebrates their one year in L.A. with “Taste Of Feastly” a strolling tasting event with break out chefs that include Ted Montoya (Zagat 30-Under-30 2016; Calo Provisions); Darren Saypharaj (Zagat 30-Under-30 2016; We Have Noodles); Paul Shoemaker (Michelin-Starred Chef; Co-Owner, INTRO) and more. Guests will dine on Pork Belly Adobo Tacos with strawberry pico de gallo; Salmon Skin Chicarrons with cured salmon belly and smoked roe; Butter Poached Sweet Potato with labneh and green breadcrumbs; and more. The best part is each of the chef’s dishes will be paired with wine and beverage samples! Tickets cost $50 per person. 7. Get a taste of summer thanks to Chef Kenny Spost of Napa Valley Grille. The west side spot is now serving a special three-course summer menu featuring fresh seasonal produce, a filet mignon and jumbo prawns entree and a decadent baked chocolate chip skillet cookie for $35. 8. Greenbar Distillery is hosting a cocktail classes in Downtown LA this Friday with seasonal fresh produce cocktails using rum and whiskey. 9. Take a Downtown Los Angeles foodie walking tour and savor what the bustling neighborhood has to offer. The tour is three hours long, participants will stop at six popular spots to eat and the tour guide will take folks through the history of DTLA. 11. Black Rabbit Rose, part theater for magic and variety acts and part craft cocktail bar, takes you into their retro-style cabaret shows set in an intimate and mysterious setting. The bartenders will dazzle you with their tricks as you order an original drink like the Smoke n Mirrors or a Thai Tea inspired libation called the Siamese Twin. 12. Constitution Happy Hour at AMMO at The Hammer continues this Friday with a focus on the question “Can we achieve racial justice under the Constitution? ” The museum is free and the happy hour takes place in the center court yard of the westside museum. 13. Sierra Nevada’s Beer Camp is one of the largest craft beer celebrations and takes place in eight cities nationwide. For Los Angeles the event will be held at Queen Mary Events Park and will include unlimited samplings of hundreds of craft beers, food trucks, live music and more. For a full list of participating breweries, visit here. 14. Fork in The Road will switch to 2424 and re-open on their Main Street Santa Monica property this Saturday. To celebrate the grand re-opening, chef John Carlos will roll out a new menu and will offer $2 Beignets all day on Saturday and Sunday to celebrate Summer Soulstice as well as a $24 tasting menu. 15. 40z & Waffles returns with a special BET Weekend edition promising a “super lit brunch and day party.” The summer kick off party will be held at Liaison Restaurant + Lounge in Hollywood. Expect brunch, beer pong, complimentary D’USSÉ cocktails (first hour) and loads more. The event runs from noon to 5 p.m. admission is $20. 16. Art Beyond the Glass returns for its sixth year of bartenders showcasing their cocktail artistry in a multi-sensory experience and art beyond the bar like painting, photography, live music and more. Hosted by whisky legend Martin Daraz, some bartenders participating in ABTG VI this year include: Adam Fournier – Faith & Flower, Alyson Iwamoto – Here’s Looking At You, Bethany Ham – Birds & Bees, Chris Amirault – Otium, Edwin Cruz – Winsome, Jodi Calderon – Normandie Club, Kim Stodel – Providence, Ryan Wainwright – The Ponte and Yael Vengroff – The Spare Room. Proceeds from the event will support storytelling nonprofit The Moth. Taking place at Los Globos in Silver Lake. Tickets cost $60 per person.